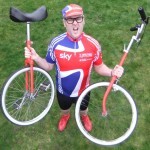 Solo Circus | Cycling Entertainer. 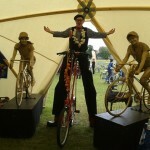 Welcome to The Circus of Eccentric Cycles presented to you by Solo Circus aka Mark Russell, cycling enthusiast and purveyor of cycle related and other circus entertainment since 1994. 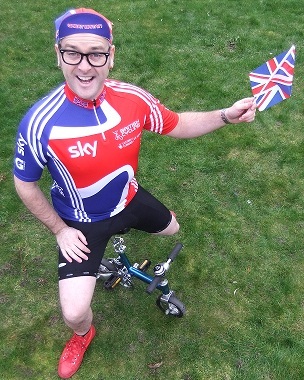 I provide Comedy Cycling Entertainment suitable for Trade shows, Cycle Festivals, Green Events, Bike Races, Sportives, Brand / Product Promotions, and any event cycling related or otherwise. 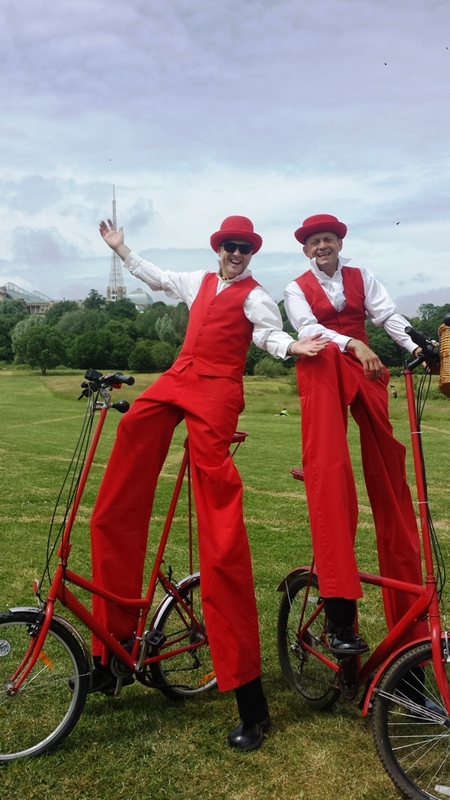 There are five types of cycles used in the performances of Solo Circus, these are the Stilt Bicycle, the Mini Clown Bike, the Sea Sick Bike, the Penny Farthing and various Unicycles. 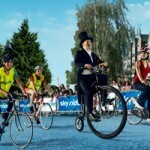 On most cycle events, all five different bicycles are used, often with a different costume on each one! 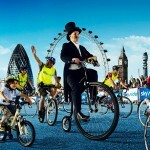 A cycling entertainer can be adapted to almost any event whether the event itself has any cycling roots or not. 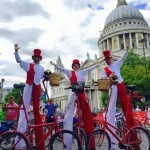 The stilt bicycle, sea sick bike and the penny farthing are all great additions to an event where a large area needs to be covered by an entertainer, for instance a city centre, large fete or any type of festival. 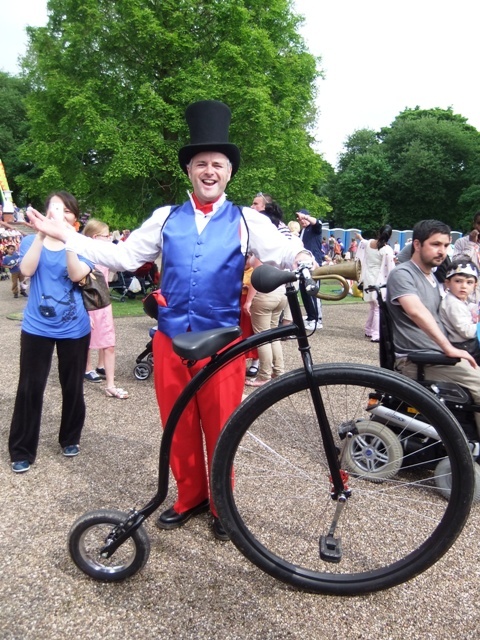 On the other hand, an eccentric cycling entertainer would be a great addition to an event which is actively promoting cycling and/or green issues. 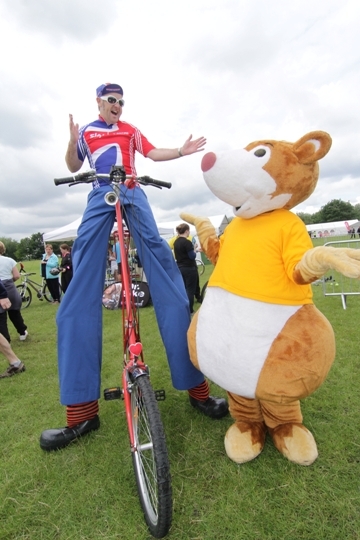 Previous cycle related events performed at include the Tour of Britain, Tour de France, Giro d’italia, Tour Series, Ride London, the opening of Peterborough’s Green Wheel cycle routes and various other cycle road shows and events throughout Bike Week and the rest of the year. Stilts Bicycle. 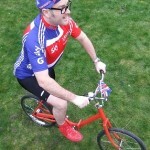 This was new in 2003. 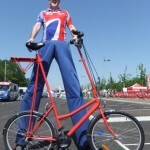 Just in case you can’t comprehend a stilts bike (you are not alone!) let me fill you in. 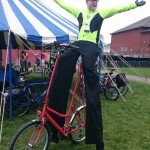 Solo Circus’ stilts bike is a converted 15 speed mountain bike. 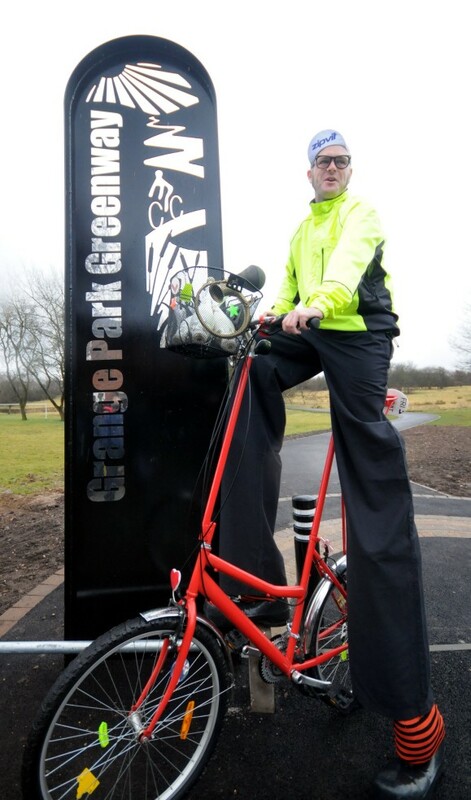 The seat and handle bar stems have been extended to approximately 6 feet high. 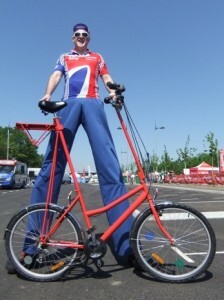 It is as a normal bicycle only taller. 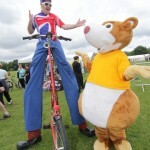 What is not normal (in fact rather rare) is that the bike is riden whilst wearing a pair of stilts! 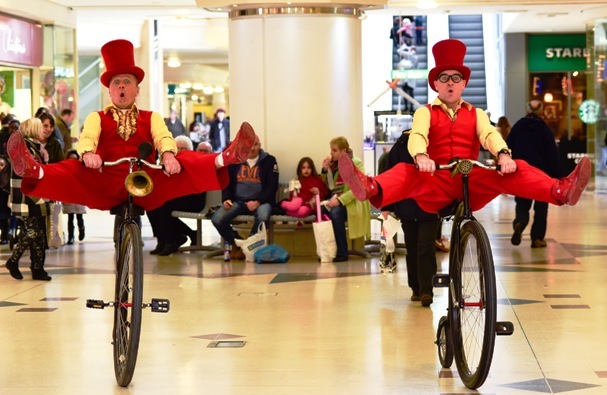 A great walkabout act that really catches peoples attention. 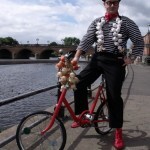 On board, a basket of various props is carried so that Mr Doo can stop and entertain with his juggling skills, magic, balloon modelling or just stop for a daft chat. 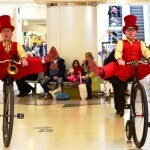 A mini sound system is also often carried to give some low level musical ambiance to the performance. 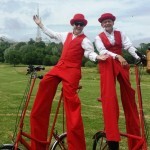 The Stilts bike is a great roaming act. 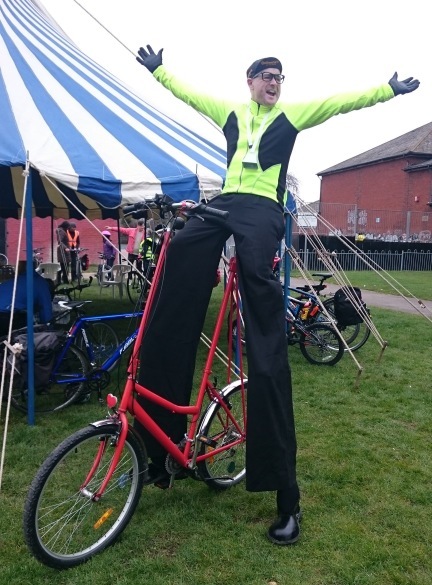 A real jaw dropper for events with enough space for a comedy character to ride around entertaining on a six feet high mountain bike! 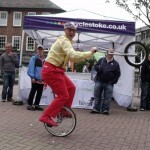 Ideal for town centre events, fetes, festivals and anything else you fancy. 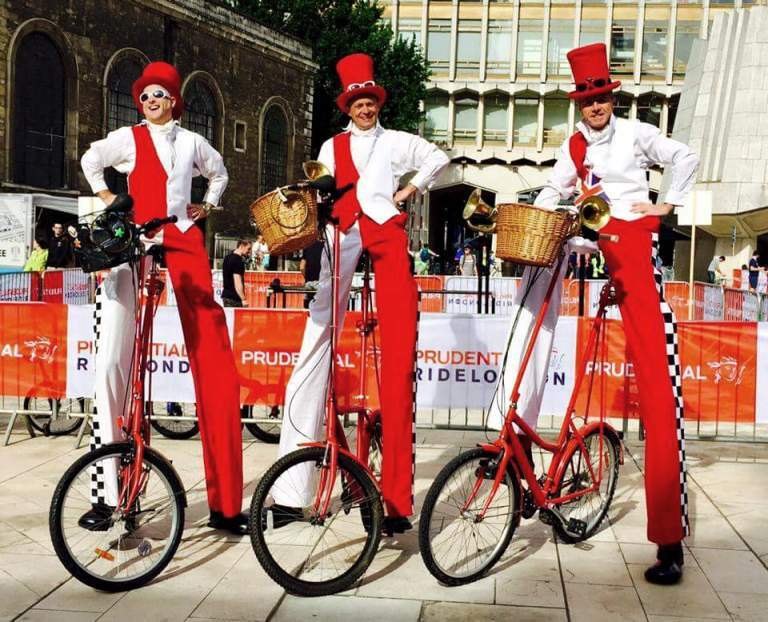 This is a rare act mainly due to the fact that most stilt walkers are not quite mad enough to ride a bicycle whilst wearing stilts! 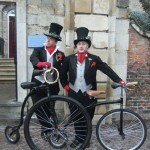 I do however know a couple of other nutters who are mad enough so why not book two or even three stilt cyclists. 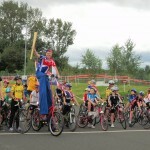 Performed in various costumes including Olympic/racing and French onion seller. 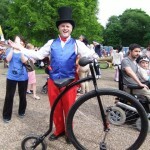 The Penny Farthing used by Solo Circus seems to create a real stir in public places. 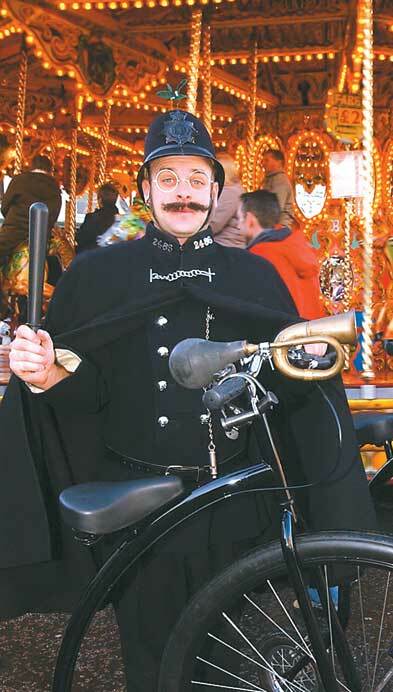 The sight of a Victorian style policeman cruising up the street blowing his whistle and honking his hooter really does give rise to many smiles and much laughter. 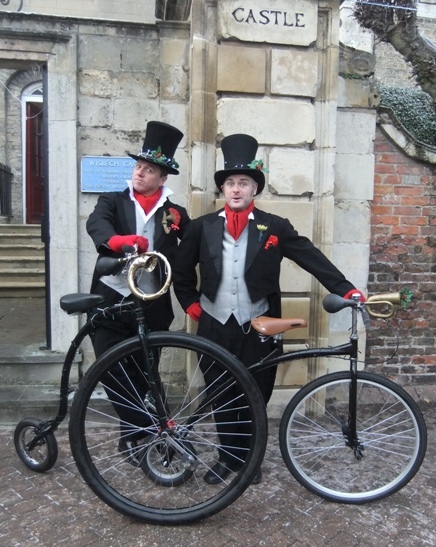 The Penny farthing is also performed in various other costumes including… Mr Dandy Doo – Victorian gentleman / juggler, traditional cycling gear with a twist and the latest Character in the saddle, the Vintage Country Gent, pedalling about in his finest tweeds… absolutely spiffing! 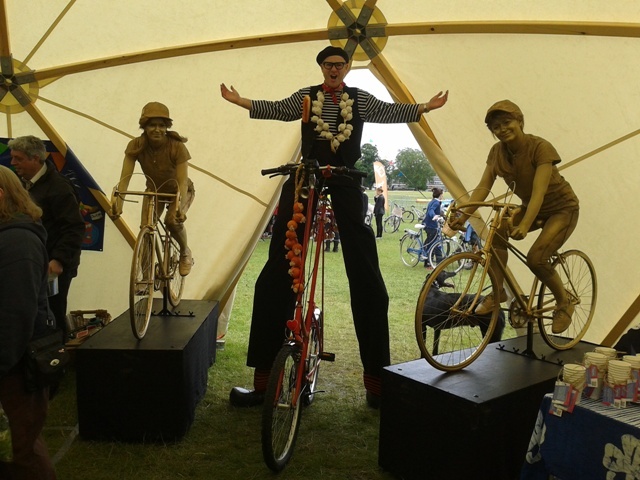 When performing with this bicycle small personal performances of juggling etc. 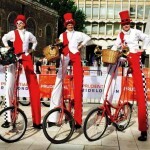 are provided around your event. 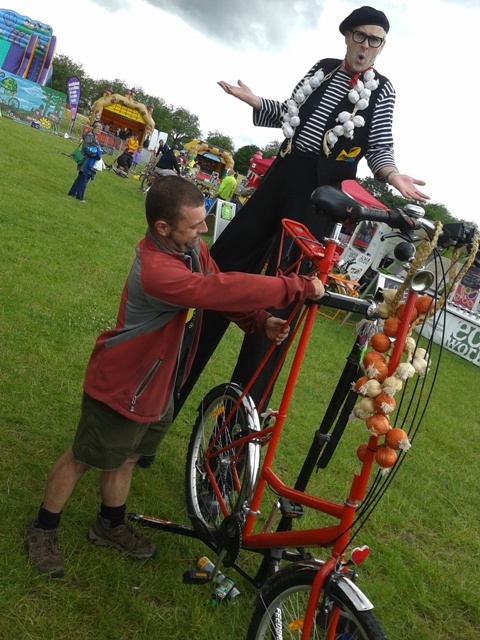 The Mini Clown Bicycle is a really silly mix & mingle act especially combined with the rather large clown shoes! 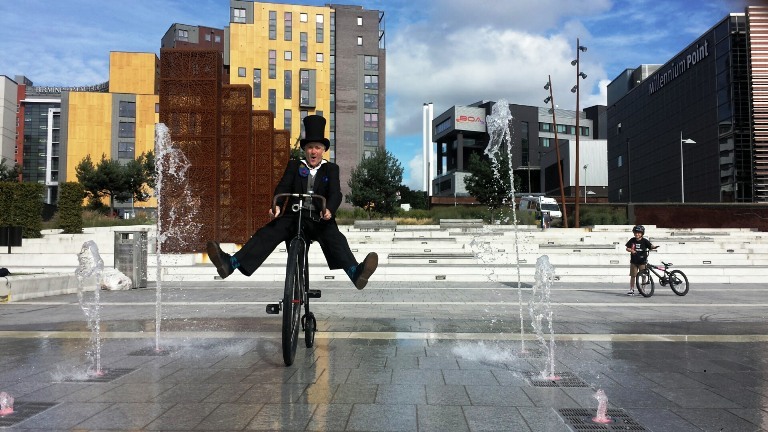 The mini bike is suited well to smaller areas than the stilt bicycle, places such as shopping centres are ideal. 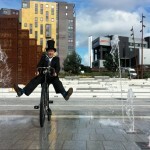 Mr Doo cruises about and stops for a bit of daft banter here and there. 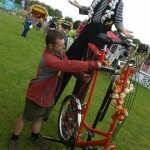 Mini bikes are also used in some circus skills workshops. 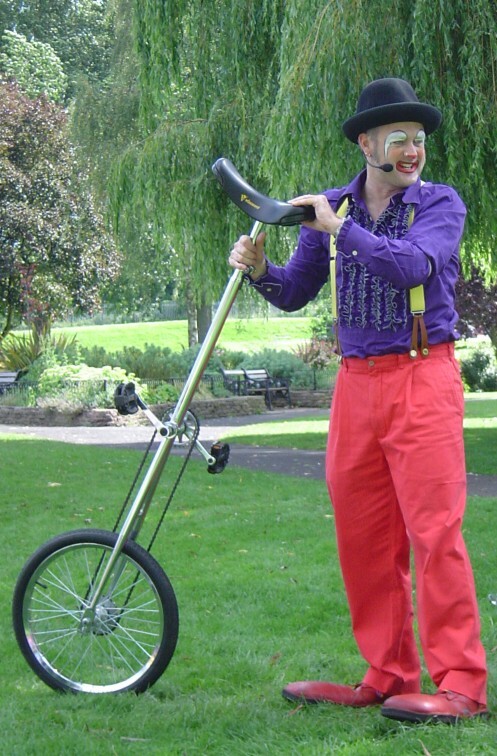 Unicycles are used by Solo Circus in static juggling shows during the finale, and for mix & mingle entertainment. 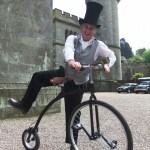 Usually the finale will consist of a five or six feet high unicycle being ridden whilst juggling clubs, knives or fire. 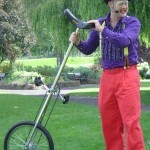 A combination of an axe, knife, fire tourch or rubber chicken are also juggled on the tall unicycle. 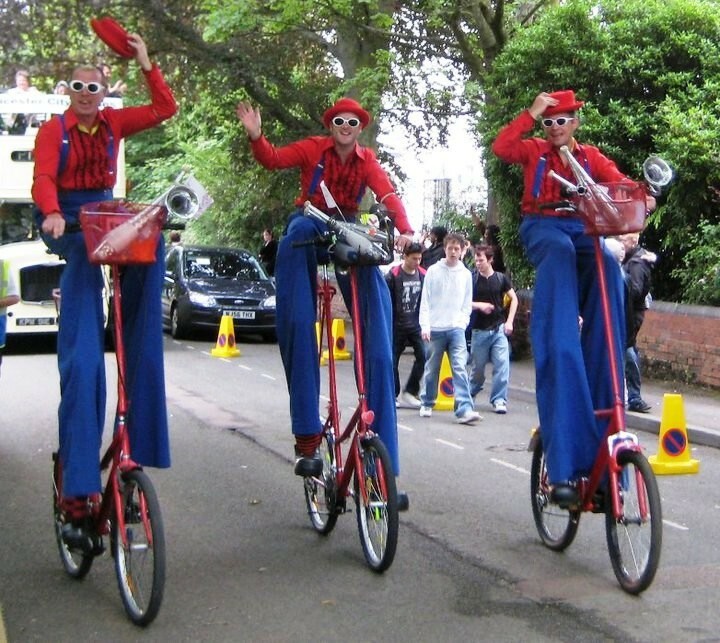 Smaller unicycles are often used for mix & mingle performances. 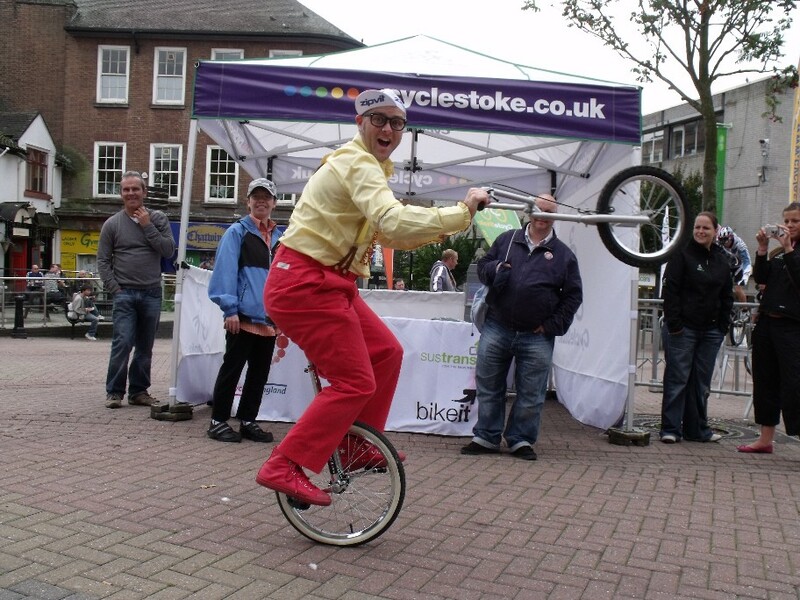 A standard size unicycle is used for this usually with a set of detached handle bars and wheel. 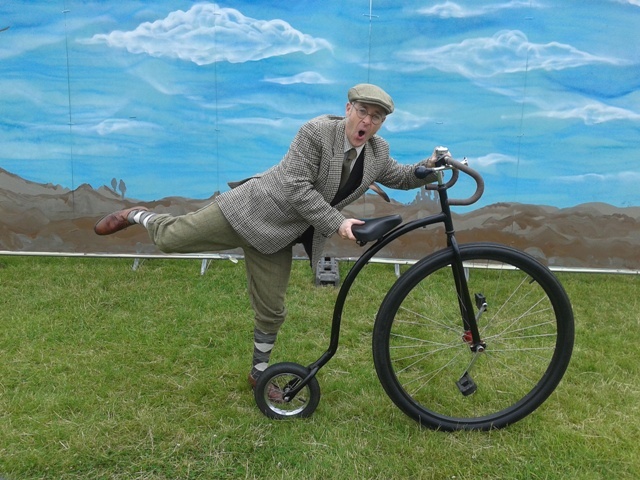 This is really popular with the public as with all the other bikes it produces lots of comedy moments! Sea Sick Bicycle. 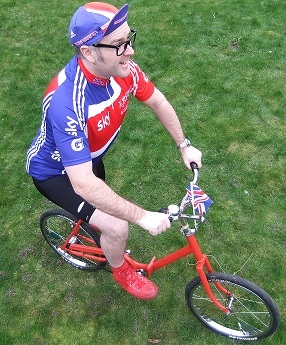 This was new for 2010. 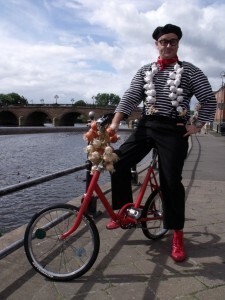 The sea sick bike is a stripped down folding shopper with a fixed gear, painted bright red with eccentric wheels. 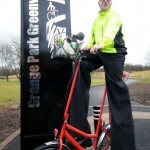 This basically means that the wheels are off centre and the bike goes up and down as I cycle along. 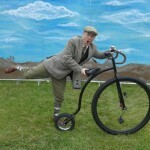 This quirky looking trick bike has been going down very well since it’s creation, a true clown bicycle! 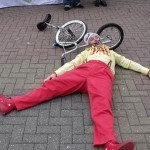 All the circus bikes mentioned on this web page are performed in a comedy mix & mingle style rather than a static show. 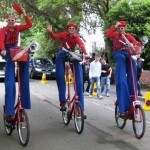 Although the tall unicycles are used in shows and a short mini show with just these can be provided. 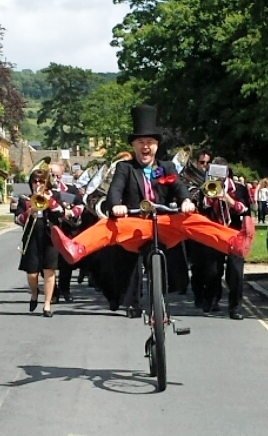 During an average 5 hour gig, any combination of the trick bikes can be used / performed. 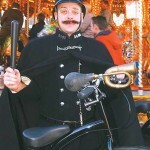 Often with a different costume on each one. 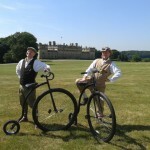 This is a very unique package of cycle related entertainment you are unlikely to find anywhere else. 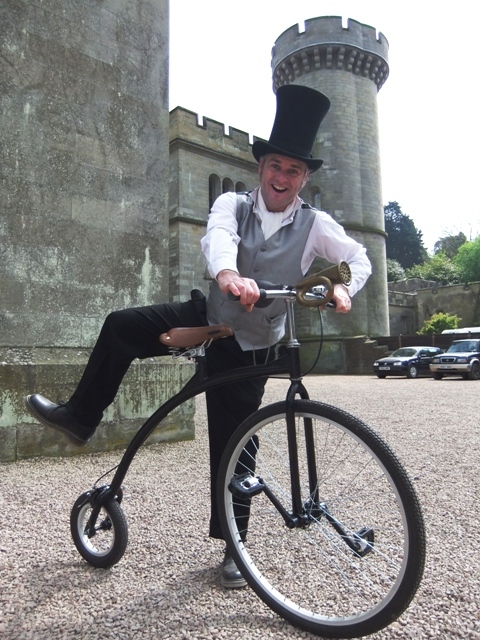 The One Man Circus of Eccentric Cycles gives a real element of fun to any event, but is an excellent choice for an event which wishes to encourage cycling as a fun activity for good health, low environmental impact, practicality and sheer enjoyment. 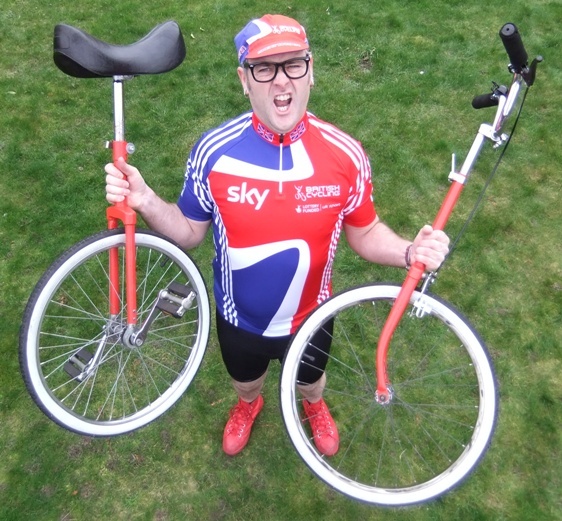 Which lets face it…cycling is all of this! 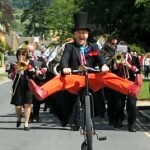 To get a quote for a performance please get in touch. 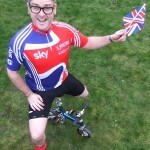 All the testimonials below are from recent clients for whom I have performed my comedy cycle acts. “Mark performed at the Oldham round of the Halfords Tour Series in June 2012. 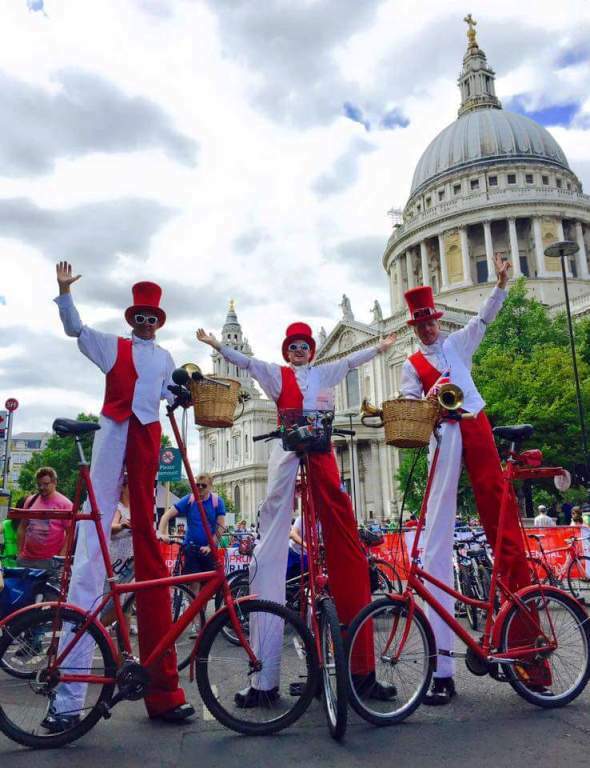 “Mark performed at our Family Bike Fest last year – this event is attended by about 500 people, mostly families with young children, and the aim is to provide a fun day out with a wide range of activities. 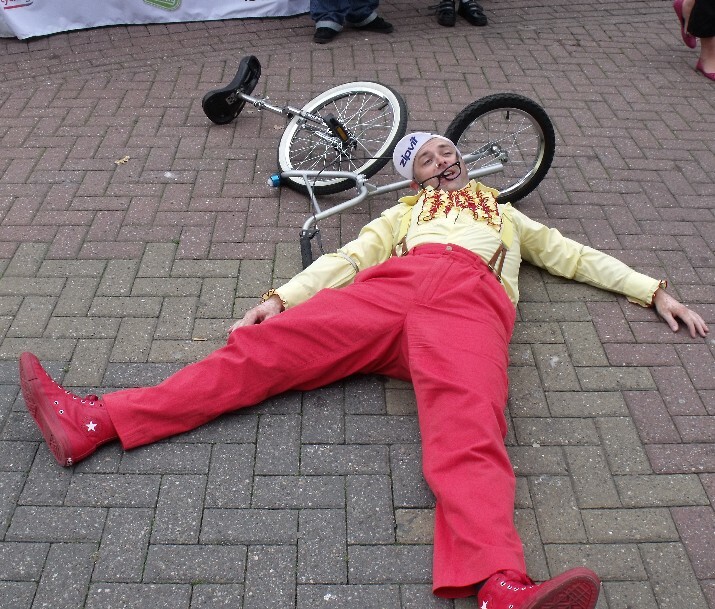 “Mark was extremely professional and accommodating throughout the entire process. 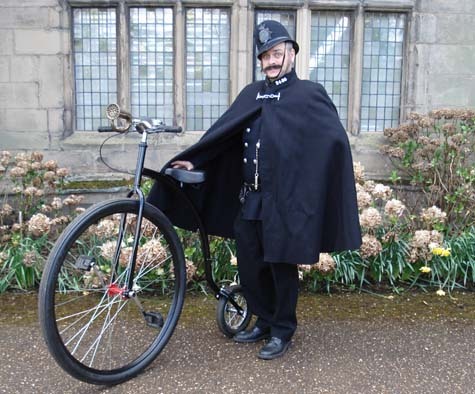 We initially booked Mark to work with us for a three day stint in June 2010 for Bike Week in Chester. 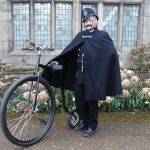 He turned up with a diverse range of entertainment equipment and costumes to entertain the passing members of the public. 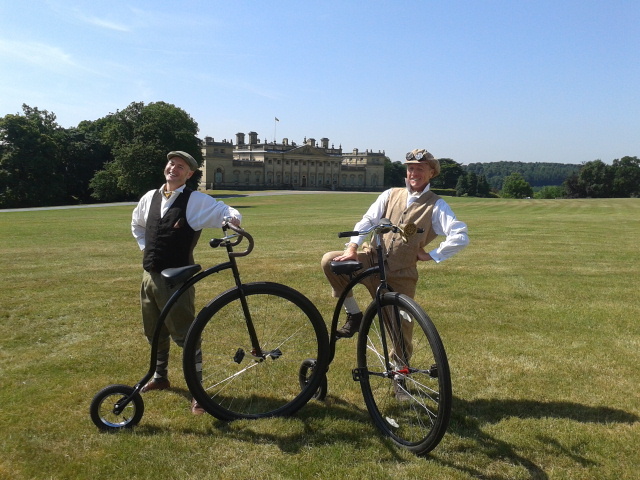 I have to say that much of the attention we received on the day were down to Mark and his ability to engage with the public and increase their interest in what we were trying to promote.